With the dough made in the bread machine, this is a kid-friendly activity masquerading as a snack. I've adapted the recipe from the "Electric Bread; A bread machine activity book for kids"
Place dough ingredients in bread machine set on "dough" setting. 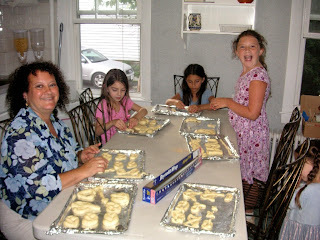 Hand out portions of dough to each child for shaping. Give each child a (optionally foil lined) ungreased baking pan. For best results, suggest that dough shapes of similar widths are grouped together on baking pans. (i.e. all the tiny, thin pretzel shapes on one pan, all the fat ones on another.) This allows for more even baking times. 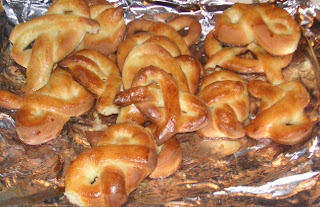 Just before baking, brush each pretzel gently with the egg wash, and sprinkle with the optional salt or cinnamon sugar, if desired. Bake until golden brown, 12-18 minutes. YUM! We haven't made pretzels for a long time.... Thanks for the reminder of this great kid-friendly baking project. Thanks for the heads-up about the foam-core sale at Michael's. It came just in time; I was just asked (not one hour ago) to do the doll house project with a classroom full of kids! is it necessary for this recipe? A bread machine is a device that will take the ingredients for making yeast breads, and will heat, mix, and knead the dough on a timed cycle. 1. Use warm water (warm like what you'd serve to a baby - test on your wrist) dissolve the yeast in it for 10 minutes. 2. Add all the other ingredients, except the flour, to the yeasty water and mix. 3. Add the dough, and mix until it forms a dough. 4. Let it rest 10 minutes. 5. Knead the dough about 5 minutes. 6. Let the dough rise about an hour, until doubled in bulk. 7. Proceed with the instructions in the recipe, from the "hand out portions of dough" part. The bread machine does the above steps automatically, but it is absolutely NOT necessary. 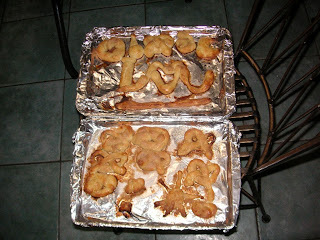 In fact, if you DON'T use a bread machine, you can double or triple the recipe to make many more pretzles. thanks. im gonna save this recipe.